To migrate your legacy public folders to Exchange 2013, you should follow all the steps described on the official Microsoft article. Step 2 of the article mentioned above, helps you prevent errors related to the public folder name, such as having a “\”. But this blog post is related with something which is not covered by the article, and that can make your public folder migration request throw an error: Invalid alias on mail enabled public folders. Note: On the above cmdlet i used both the baditemlimit and largeitemlimit set to 200, because i knew that my public folders had a significant number of both bad and large items. If that is not your case keep the bad and the large item limits to a minimum if at all specified. 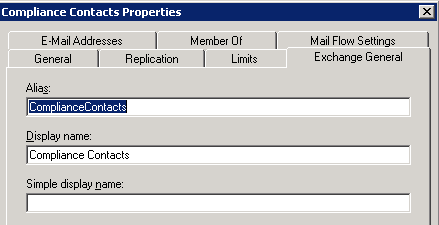 On the screenshot above you can see that the mail enabled public folder “Accountancy Properties” has an invalid alias, and that is because you cannot have spaces (and other characters as shown above) on the alias. So the next step would be to fix all mail enabled public folders with invalid aliases. Note: On the cmdlet above, if you’re problem is not limited to spaces on the alias, you can change the where-object filtering to try and find other invalid characters. You can open your Exchange Management Console, go to tools and then open the Public folder Management Console. Expand the Public Folder tree and go to the properties of each public folder with problems. On the “Exchange General” tab change the alias and apply, as shown below. Once you set the valid alias you problem is solved for that specific public folder. You might be thinking “how can i automate this for the dozens or hundreds of public folders i have with issues?”. Well the answer is you should use that csv file you exported with all the public folders, insert a column with valid aliases, build a script that reads from the csv file and run it from the Exchange Management Shell to have all your folders fixed in one go. In my case i had a low number of folders with issues, so i haven’t built the script. I am planning to build 2 scripts, one to export public folders with issues and another one to use that exported file and fix those issues, but at the moment i don’t have it. Feel free to ping me an e-mail or comment if you’re interested on the script and i can find some time to build it. It should be a fairly simple script. Or feel free to have a go on doing that. Finally after the new request is created, you can see that now the migration is ongoing and went past the Public Folder Hierarchy creation without issues. Are you trying to migrate your public folders from legacy Exchange versions to Exchange 2013? And are you getting stuck on a “StalledDueToMailboxLock” error when you try to resume the migration? Well then continue reading. I will try to keep this post short and simple, just like the solution to your problem. So in summary, you download the scripts, estimate the number of public folder mailboxes you will have, name and create those mailboxes and start the migration process, that will suspend at 95% with all the data migrated except the delta. And what is the purpose of this cmdlet? Simple.. to block the access from the users to the legacy public folders, so that you can migrate the delta, unlock the access on 2013 (Step 8), and have all users using the new modern public folders. So what can go wrong and when can you see the “StalledDueToMailboxLock” Status? After you run the Set-OrganizationConfig -PublicFoldersLockedForMigration:$true cmdlet, the changes need to apply on the legacy public folders, before you resume your migration by running the Resume-PublicFolderMigrationRequest -Identity \PublicFolderMigration cmdlet. If the changes are not applied yet, than your public folder migration request will resume and a minute or two later it will get into a “StalledDueToMailboxLock” status. First try and access the public folders, from an Outlook client. Can you still access them? Well that means they are not locked and the changes didn’t apply yet. The request should now complete without issues, and you can continue following the steps on the link i provided earlier on this post, to get your public folders running on 2013. Any questions about the entire process let me know. Just a few days ago i was using MigrationWiz to push a customer from a hosted Exchange to Office 365. Usually when there’s no possibility of building a Hybrid Deployment, in cases when the source system is a hosted Exchange or a 3rd party e-mail platform, i recommend and use MigrationWiz as the tool to migrate the mailboxes data into Office 365, as it’s an excellent tool and easy to use, which is very handy because we tend to offload the bulk migration of the users to the customer’s IT department. Well i was sure that the source mailbox existed as i was able to log into it via Outlook Web Access, so what was the problem? But again back to the problem. Those MigrationWiz EWS queries will fail if the mailbox is hidden from the Global Address List. And that was my case. Why? Well for starters you might want to hide from the global address list on the source (and even the destination), a mailbox which is in fact only used for migration purposes. The solution? Disable the hide from address list option on the mailbox and you’re sorted.